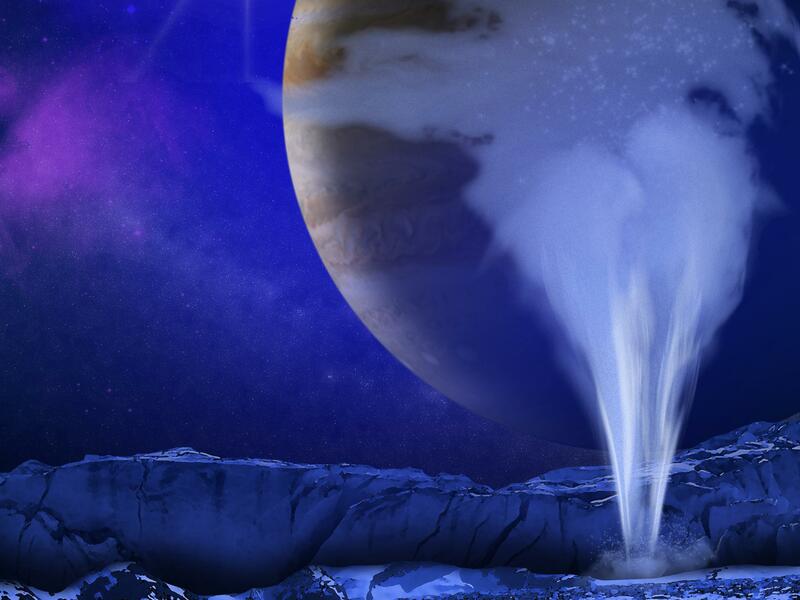 This is an artist's concept of a plume of water vapor thought to be ejected off of the frigid, icy surface of the Jovian moon Europa, located 500 million miles from the sun. Scientists have new evidence that there are plumes of water erupting from the surface of Jupiter's icy moon Europa — plumes that could, maybe, possibly contain signs of life. The evidence comes from data collected by the now-defunct Galileo spacecraft. Although the data has been available since it was collected in 1997, it's only now that an analysis confirms the existence of water plumes. For more than two decades, scientists have been convinced Europa has a liquid water ocean sloshing around beneath its icy outer crust. In the past six years, two teams of researchers using the Hubble Space Telescope reported the possible existence of plumes. But as powerful as Hubble is, seeing something as small as a plume on a moon more than 380-million miles away is difficult. "We're looking for effects that are relatively small, and are pushing the spatial resolution of the telescope," says astrophysicist Susana Deutsua of the Space Telescope Science Institute. Nonetheless, it made sense that Europa had plumes, since the Cassini spacecraft had definitely seen water plumes from Enceladus, an icy moon orbiting Saturn that's similar to Europa. "When we first saw those images, I think a lot of us in the community were very excited," says planetary scientists Xianzhe Jia from the University of Michigan. Jia did his graduate work at the University of California Los Angeles where he focused on data collected by Galileo. A year ago, Jia heard a scientific talk about the plumes. He learned that they were near the equator of Europa, a region Galileo had flown directly over in 1997. "That's the moment where we realized that we might have something in the old Galileo data that we never paid much attention to," Jia says. Galileo recorded tons of data in the seven plus years it orbiting Jupiter. Jia was particularly familiar with data from an instrument known as a magnetometer that measures magnetic fields. Turns out plumes give off a distinctive signal that a magnetometer can measure. "When we look at those data carefully, what we found is there's some strange magnetic signals in those data that have never been explained before," Jia says. As Jia and his colleagues report in the journal, Nature Astronomy, the best explanation was the signals were indeed generated by plumes of water coming from Europa. This means future missions to Jupiter could fly through these plumes and look directly for signs of life. So why hadn't scientists figured this out when these data were recorded back in the 1997? Margaret Kivelson was principal investigator of the magnetometer on Galileo. She remembers puzzling over the magnetometer signals. She says her team had already made the outlandish but ultimately accurate suggestion that there was a liquid ocean under Europa's icy crust. "To go from there to also there are geysers coming up from that ocean, we just weren't ready for that," Kivelson says. Kivelson has been studying Jupiter and its moons for a long time. She's looking forward to NASA's next mission to the giant planet. "I hate to tell you how old I'll be when the mission gets to Europa, but that's OK," she says. Kivelseon is 89 now. The mission may not arrive until 2028. You can do the math. OK. Don't get too excited, but scientists think there are plumes of water erupting from the surface of Jupiter's icy moon Europa, plumes that could maybe, possibly contain signs of life. There's growing evidence these plumes exist. It's data from a long-dead spacecraft. NPR science correspondent Joe Palca explains. JOE PALCA, BYLINE: Scientists think Europa has a liquid water ocean sloshing around beneath an icy outer crust. Since 2012, two teams of researchers using the Hubble Space Telescope thought they might - might - be seeing plumes shooting out from the moon's surface. XIANZHE JIA: When we first saw those images, I think a lot of us in the community were very excited about. PALCA: Xianzhe Jia is a planetary scientist at the University of Michigan. He did his graduate work on a now-defunct mission to Jupiter called Galileo. He says just about exactly one year ago, he heard a talk about the plumes, and he learned that they were near the equator of Europa, a region Galileo had flown directly over in 1997. JIA: That's the moment where we realized that we might have something in the old Galileo data that we never really paid much attention to. PALCA: Galileo recorded tons of data in the seven-plus years it was orbiting Jupiter. Jia was particularly familiar with data from an instrument known as a magnetometer, which you won't be surprised to learn measures magnetic fields. Turns out, plumes give off distinctive signals that a magnetometer can measure. JIA: When we look at those data carefully, what we found is there's some strange magnetic signals in those data that have never been explained before. PALCA: As Jia and his colleagues report in the journal Nature Astronomy, the best explanation was the signals were indeed generated by plumes of water coming from Europa. This means future missions to Jupiter could fly through these plumes and looked directly for signs of life. So why hadn't scientists figured this out when these data were first recorded back in 1997? Margaret Kivelson has an answer. MARGARET KIVELSON: I was the principal investigator of the magnetometer on Galileo. PALCA: She remembers puzzling over the magnetometer signals. She says her team had already made the outlandish but ultimately accurate suggestion that there was a liquid ocean under Europa's icy crust. KIVELSON: To go from there to also, there are geysers coming up from that ocean, we just weren't ready for that. PALCA: Kivelson has been studying Jupiter and its moons for a long time. She's looking forward to NASA's next mission to the giant planet. KIVELSON: I hate to tell you how old I'll be when the mission gets to Europa, but that's OK.
PALCA: Kivelson is 89 now. The mission may not arrive until 2028. I'll let you do the math. Joe Palca, NPR News. Transcript provided by NPR, Copyright NPR.